We are exposed daily to hidden estrogens and this can produce many unpleasant effects. If you have symptoms such as mood swings, PMS, bloating, headaches, hot flashes, and insomnia, then you may be dealing with estrogen dominance. This occurs when there is too much estrogen and not enough progesterone to balance its effects. High estrogen also keeps your body from using testosterone which is linked to losing muscle mass and lowering energy and stamina. Dim 2:16 is a three dimensional approach to supporting healthy estrogen metabolism. 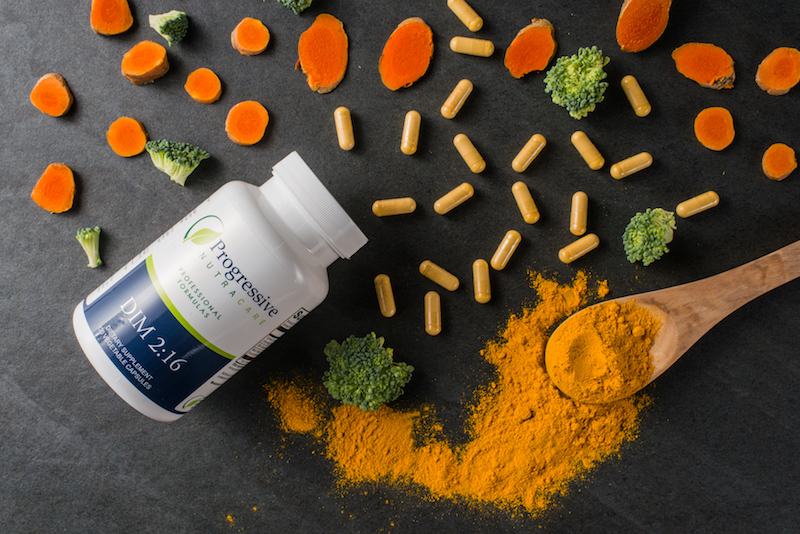 With a powerful combination of DIM, curcumin from turmeric extract and the patented black pepper extract, BioPerine, Dim 2:16 has been shown to support balanced estrogen. DIM / Diindolylmethane is critical to support hormone metabolism, especially estrogen, support immune activity as well as stimulating antioxidant and natural detoxification. DIM research has shown beneficial effects on reducing effects from estrogen hormone replacement therapy and several estrogen related health conditions such as endometriosis, PMS, and has also been studied to support prostate and thyroid health. DIM is a phytochemical produced from a chemical in cruciferous vegetables such as broccoli, brussel sprouts, cabbage and cauliflower. DIM is a powerful modulator of the immune response system and has been studied as therapy for viral and bacterial infections, antibiotic-resistant bacteria and skin disorders such as acne. Dim 2:16 is a nutritional supplement intended to support healthy estrogen metabolism. Dim 2:16 is for individuals looking to regulate estrogen, who have taken birth control pills or hormone replacement therapy or have higher than normal PMS symptoms such as bloating, mood swings, and insomnia. Dim 2:16 is intended to take 2 tablets daily or as directed by your healthcare practitioners. Saved me from my migraines!! I had horrible migraines for years!! Always during my period, once a month!! I felt like I had drank a lot of alcohol the night before and had the worst hangover, with nausea, throwing up, and horrid headaches!! After years trying everything you can imagine to cure them; after going to several doctors, urgent cares, and doing tons of exams, nobody could tell me a simple thing: my liver was not metabolizing well my estrogen and that’s what was giving me terrible migraines!! My chiropractor was the one who told me to try DIM!! This product changed my life completely!! My migraines are gone!!! But I have to keep taking the pills, because I stopped them for a few weeks and during my next period, I had migraines all over again! As long as I am taking them, I am fine!! I completely recommend if your symptoms are similar! It was a miracle!! !